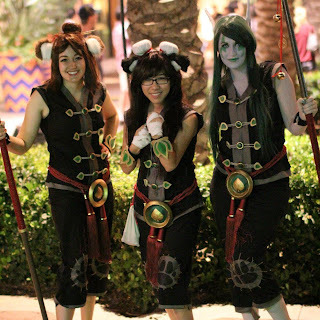 It's time for the last installment of my Monk series! Hopefully you have all been enjoying it so far, as I've had a great time writing it. The final part of the costume was the polish, the finale, bringing it all together. 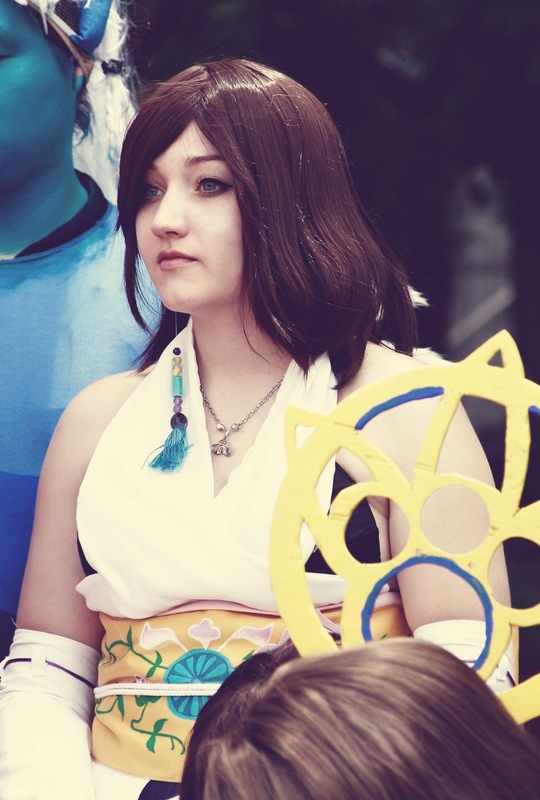 I really like to focus on the smaller details that make a costume, such as the wig, the makeup, all of the parts that compliment the actual hard work you put into sewing and prop construction! Choosing a wig is sometimes the first thing I do, since it can oddly end up being the longest process. Ebay is my go-to for wigs, as it's got the largest selection. Lots of cosplayers buy locally, or, have favorite stores online. I haven't found a store online that is both reliable, and, offers the variety in selection I need. So ebay is the one for me! Using this, and a cool make-shift bun hairpiece that I bought at cvs (they are these cool like, bun-extensions that help make hair buns), I brought the wig together. I did the bun, and then painted nice chopsticks to add in. Wearing a wig really helped later on when I had to attach the ears. These were super fun to make, and reminded me of making small stuffed animals. I went to Joanns and in the foam areas (maybe the fabric area, depending on your store), found small sheets of fur. I bought black, brown, and white (as I was making all of the ears for our group). I started out by cutting two large pieces of the colored fur (brown in my case) and two smaller pieces of white fur. After cutting them out, I sewed the two colored pieces together, leaving a small hole in the bottom to stuff it. Once I put the stuffing in,I sealed it up. I found that I had to trim a lot of the fur, because after I stuffed it, the hair was poking out all over like a hot mess. Following the stuffing, I sewed on the white patch of fur to make the ear. I trimmed the fur again for the white (the sheets I bought were like, super long strands). However, for the more red-panda style, I'd say only cut a portion of it. Leave some of the fur long as it adds to the wispyness. You can see the difference below, between the black and the red panda. But these are the finished products! After completing the ears, I sewed them onto a hair clip that was large and sturdy. I sealed the thread with hot glue (this step is super important - helps the ears from sliding on the clip). Just as I did with the wig, I took to ebay to help me out. I knew I needed something large, and since I was doing the red panda model, I needed it to have the ringed fur and white tip. It was something I hadn't had to search for before, I so I took a few days to look over my options. 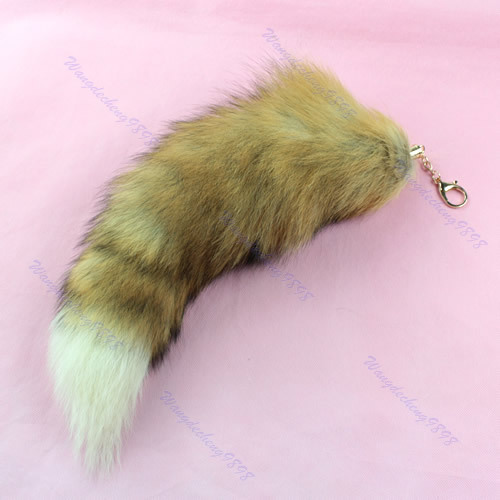 I found a couple stores on ebay that sell fox tail keychains, or raccoon tail - you can go all out and get a real one that is quite expensive. Or, you can buy a faux-fur one (which is better anyway, save the animals here!). The nice thing about the keychains is that you can clip them on to the belt, or wherever you may be using them for the costume, and they are super sturdy! I didn't worry about my tail at all, and got to wave it around. Search around online and find the one you like. Definitely order this one in advance too, as I found mine from a seller in China, so it took about a month and a half to get here (just like my wig). The is the fun part that you get to do day of! Typically, I'll put on my wig cap first, and then my costume, and then do my makeup, and put on my wig last. This helps the wig from putting too much pressure on my head (freedom for just a little bit longer) and ensures your makeup doesn't get on your costume as you attempt to put it on. For the Monk, I help things really simple. If polish counts as makeup, then here's what I did! I found a nice teal nail polish that matched the green's used in the rest of the costume, and did that on my hands and toes (as we were wearing sandals). For actual makeup, I did simple foundation and blush, and then as large and bright of eyes as I could make. There are some nice "anime" makeup tutorials online that you can borrow steps from. I'd always recommend using white eyeliner to make your eyes look larger, and black eyeliner to accentuate the line and shape of your eye. Finally, use false lashes to really give your eyes that extra bit of pop that they need to stand out in costumes. Things to note: When it comes to make up for cosplay, always go matte matte matte! This is so important! If you try to find shimmery or sparkly things, they will often create glare or make you look oily in pictures. Trust me, this is a terrible effect. So look for the makeup that mattifies your face, and bring some extra when you go the event so you can touch up here and there. Always pack extra eye-lash glue in case your lashes start to get loose. You're all done! Time to don your costume and rock it at the event! This is the best part, so put on a big smile and show off all of your hard work. :] I hope you all enjoyed this tutorial, and I'm looking forward to sharing more soon! Please leave any questions in the comments below! I'd love to help out if I can!